Gastroesophageal reflux/Heartburn. Acid belongs in the stomach and seldom causes any problem when it stays there. When acid escapes into the esophagus through a weak or overloaded valve at the top of the stomach, the result is called gastroesophageal reflux, and "heartburn" and acid indigestion are common symptoms. Approximately 10-15% of patients with even mild sporadic symptoms of heartburn will develop a condition called Barrett's esophagus, which is a pre-malignant change in the lining membrane of the esophagus, a cause of esophageal cancer. For more information on Heartburn, its causes and possible cures, visit www.heartburnhelp.com. Gastric Bypass Roux-en-YIn recent years, better clinical understanding of procedures combining restrictive and malabsorptive approaches has increased the choices of effective weight loss surgery for thousands of patients. By adding malabsorption, food is delayed in mixing with bile and pancreatic juices that aid in the absorption of nutrients. The result is an early sense of fullness, combined with a sense of satisfaction that reduces the desire to eat. According to the American Society for Bariatric Surgery and the National Institutes of Health, Roux-en-Y gastric bypass is the current gold standard procedure for weight loss surgery. It is one of the most frequently performed weight loss procedures in the United States. In this procedure, stapling creates a small (15 to 20cc) stomach pouch. The remainder of the stomach is not removed, but is completely stapled shut and divided from the stomach pouch. The outlet from this newly formed pouch empties directly into the lower portion of the jejunum, thus bypassing calorie absorption. This is done by dividing the small intestine just beyond the duodenum for the purpose of bringing it up and constructing a connection with the newly formed stomach pouch. The other end is connected into the side of the Roux limb of the intestine creating the "Y" shape that gives the technique its name. The length of either segment of the intestine can be increased to produce lower or higher levels of malabsorption. •The average excess weight loss after the Roux-en-Y procedure is generally higher in a compliant patient than with purely restrictive procedures. •One year after surgery, weight loss can average 77% of excess body weight. 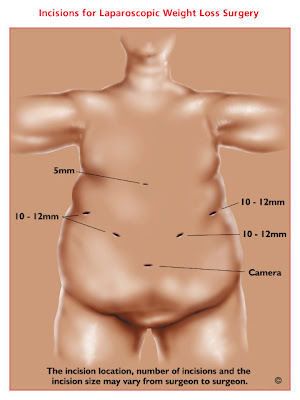 •Studies show that after 10 to 14 years, 50-60% of excess body weight loss has been maintained by some patients. •A 2000 study of 500 patients showed that 96% of certain associated health conditions studied (back pain, sleep apnea, high blood pressure, diabetes and depression) were improved or resolved. •Because the duodenum is bypassed, poor absorption of iron and calcium can result in the lowering of total body iron and a predisposition to iron deficiency anemia. This is a particular concern for patients who experience chronic blood loss during excessive menstrual flow or bleeding hemorrhoids. Women, already at risk for osteoporosis that can occur after menopause, should be aware of the potential for heightened bone calcium loss. •Bypassing the duodenum has caused metabolic bone disease in some patients, resulting in bone pain, loss of height, humped back and fractures of the ribs and hip bones. All of the deficiencies mentioned above, however, can be managed through proper diet and vitamin supplements. •A chronic anemia due to Vitamin B12 deficiency may occur. The problem can usually be managed with Vitamin B12 pills or injections. •A condition known as "dumping syndrome " can occur as the result of rapid emptying of stomach contents into the small intestine. This is sometimes triggered when too much sugar or large amounts of food are consumed. While generally not considered to be a serious risk to your health, the results can be extremely unpleasant and can include nausea, weakness, sweating, faintness and, on occasion, diarrhea after eating. Some patients are unable to eat any form of sweets after surgery. •In some cases, the effectiveness of the procedure may be reduced if the stomach pouch is stretched and/or if it is initially left larger than 15-30cc. •The bypassed portion of the stomach, duodenum and segments of the small intestine cannot be easily visualized using X-ray or endoscopy if problems such as ulcers, bleeding or malignancy should occur. •When you start eating solid food it is essential that you chew thoroughly. You will not be able to eat steaks or other chunks of meat if they are not ground or chewed thoroughly. •Don't drink fluids while eating. They will make you feel full before you have consumed enough food. •Omit desserts and other items with sugar listed as one of the first three ingredients. •Omit carbonated drinks, high-calorie nutritional supplements, milk shakes, high-fat foods and foods with high fiber content.